No, Amy Schumer isn't actually dangerous, but searching for her online can be. 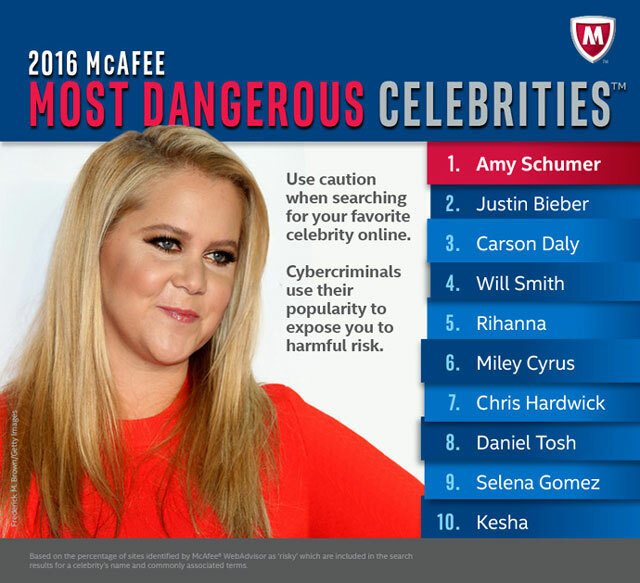 A new study from Intel Security ranks the celebrity web searches most likely to send you to malware-riddled websites, and this year Amy Schumer is at the top of the list. While hackers keeping tabs on celebrities may be surprising, there's logic to this cybercrook strategy: more people looking for information on a topic means more people likely to fall prey to malware. Disguising their hack attempts as today's exciting celebrity news is one more way to trick you into giving up your personal data—or even control of your computer. Intel Security has run this study for ten years and every year the results are a bit different. Last year the list was topped by DJ Armin van Buuren (Schumer held sixth place) and the year before it was Jimmy Kimmel. It's a pretty good bet that the more popular the topic, the more likely you are to find scams and malware attached to it. This doesn't mean you have to stop searching for your favorite topics, but it does mean you should be careful when you're browsing the web. To keep yourself safe, follow our tips below. Software companies often issue updates to fix security problems—but the only way to fix it on your computer is to install the latest software. Make sure to download updates for Windows or MacOS, your antivirus software, and your browser as soon as they're available. All of these should be able to update automatically, so be sure they're set up to check for updates and install them. The name of the website. Hackers often take advantage of common typos in website names or create sites that look almost, but not quite like a site you know and trust. Be wary of any site you aren't familiar with or a site that just looks off. Offers that sound too good to be true, like free downloads of TV shows, photos, or other content can just be luring you into downloading malware. Pages or popups that look like warnings from your computer. These will often be very dire, saying you have to click on them immediately to fix a serious problem—but they're usually trying to make you click without thinking it through. Be sure to get software updates straight from the software's maker, like Microsoft. If anything seems fishy, don't click! Just don't do it! If a website you're not familiar with asks you to download something, don't. No matter how tempting it is, downloads can be dangerous and you should never download a file from a website you don't trust. These may be disguised as harmless things, like video players or photos, but can hide malware. Websites asking for your personal information may use it for nefarious purposes. Just like with downloads, don't give any information to a website you don't trust—and be very wary of giving your credit card number to sites you aren't familiar with. Whatever you're searching for, stay safe out there!